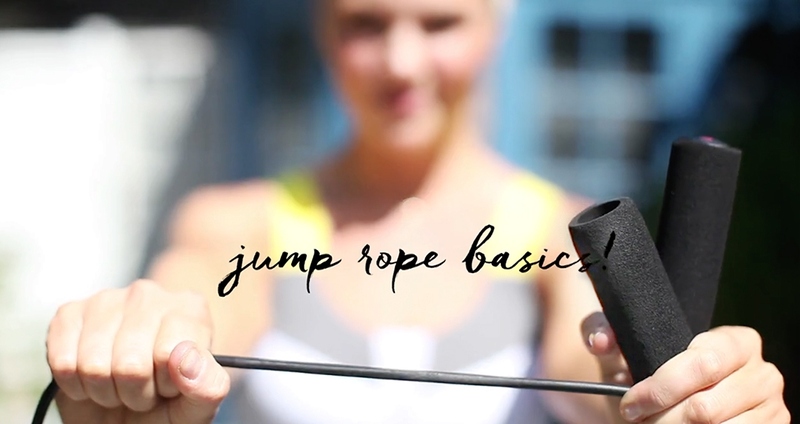 We teamed up with Amanda Kloots, former Rockette, pro jump-roper and creator of The Rope Class at Studio B in NYC, to share everything you need to know in adding jump roping to your exercise regime, or life in general. Did you know that jump roping can burn 5x more calories than other cardiovascular exercises? It’s also the most easily transported piece of workout equipment you can own. There’s no excuse not to exercise when you bring this on the road with you; you only need to practice for 20 minutes/day to reap some major benefits. Plus, it’s really fun. Build endurance, increase your heart rate, gain energy, and most importantly, enjoy yourself! Get started with these tips and tricks from Amanda Kloots below! Stand on the center of your rope; the handles should measure up to your shoulders. Remember to keep your shoulders over your hips and your abs tight! Keep drawing your navel back to your spine. Practice jumping without the rope! Keep your arms at a 90-degree angle, with your elbows slightly away from your waist. Flick your wrists in a circular motion simulating the turn of the rope; it’s a rhythm! Add your rope! Don’t change a thing from the previous step. Try for 20 jumps, then keep increasing your number. Ins & Outs: Just like jumping jacks! Start without the rope, then add it in. Keep thinking of squeezing your inner thighs on the way in and tightening your glutes on the way out. Kick the Can: This is just like hopping on one leg. First, hop with the right leg; then, on the second hop, kick with your left foot. Keep switching your legs. Practice this a lot without the rope, then slowly add it in! Cross Jump: Start this move with only your arms. With your arms out in jump position, just cross the right arm over your left (like you’re giving yourself a hug). You will notice when you have your rope in your hand that as you cross your arms it creates an opening in the rope where you then jump through. Pick up your rope and give it a try! Do 3 regular jumps and then cross your arms for the 4th jump.